Every year in the fall, a large contingent of farming families, county and MD leaders and elected officials gather in Edmonton to honour the recipients of the Farm Family Awards of Northern Alberta. A similar event is held in the summer, during the Calgary Stampede, to honour Southern Alberta’s farm families. On November 5th at the Expo Centre on the Northlands property, in a fun afternoon of inspiring speeches, award presentations and a sumptuous dinner several hundred guests paid tribute to the farm families who have succeeded in their farming choices, their family and various endeavours and who have made a difference in their community. In Leduc County, Council members were invited to submit names in which Ag Service Board members then chose one family to be recognized publicly. This year, the 2014 program has honoured Dean and Charlene Green and their children, although there were two other nominees. The content of these submissions is protected by Privacy Laws, Councillor Glen Belozer was happy to share a few interesting points of this process. For example, the fact is that this Alberta Agriculture-sponsored awards program has developed so greatly in the past few years. Counties and Municipal Districts (MDs) only get to submit names every two years to minimize the congestion of such a large event, and the awareness that 50% of such recognition is based on farming excellence, and the other 50% relates to a family’s contributions off the farm. Dean and Charlene Green farm in Division 6, the southeast corner of Leduc County, four miles south of Thorsby. Their farming partners and helpers are their three children, ages 21, 19 and 16. As their two oldest kids are pursuing their careers, only the youngest is still at home full time, being a reliable helper to his parents. Dean and Charlene raise white-faced Angus-Simmental- cross livestock and their cow-calf operation has produced close to 300 calves this year. Interestingly, the Greens have developed a 3 times-a-year breeding practice that has proven greatly effective for their calving efforts and their farm income. Most of the land the Green farm sits on is still family-owned, as Dean’s great grandparents developed it in 1914. P.D. and Mauld Calloway came from Washington State, having left their home in the spring, traveling in a covered wagon along with eleven cows and a half dozen sheep, arriving at their new homestead on a Hallowed Eve’s evening. When he was a young boy, in the first years of his deep interest in farming, Dean promised his grandparents to never let go of this sheep flock. True to his word, he has maintained a good sized flock since then. In regards to their life off the farm, the Greens maintain a busy lifestyle of church involvement and sports. Dean is a passionate and long-time volleyball, soccer and basketball coach. 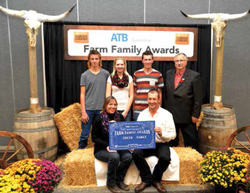 In 2013, Jeremy and Terry Komives of the Mulhurst area were the proud recipients of this award, nominated by their County of Wetaskiwin Agriculture Service Board (ASB). While farming grain and cattle, they raised two kids, Mike and Heather, and greatly contributed to the well-being of the Thorsby Feeder Association, Pipestone Curling Club, Falun West 4H Club and the Central Century Team Roping Association as Jeremy was and is a team roping competitor. Terry is a talented pianist and a singer who performs at funerals and special events. The Komives family obviously supported their community in many ways and their award was, by unanimous opinion in the County, richly deserved. At the Awards banquet, AB Agriculture Minister Verlyn Olson was a guest speaker on the podium. He heralded the Award recipients, the families who names were submitted, and all the Alberta farm families who so greatly contribute to our booming Agriculture. His green 4-H tie was noticed and he explained that it was the ‘Show Your 4-H Colors Day’, as November is 4-H Month. As for Dean and Charlene, they are taking this public honour in stride. Sharing the glory with their kids, they look forward to many more years of farming excellence, and significant contributions to their community.